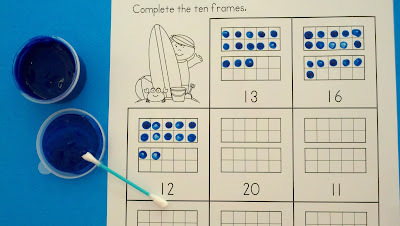 Use a cotton swab and dot paint ten frames to keep your little learners engaged while practicing "Tricky Teens" numbers. 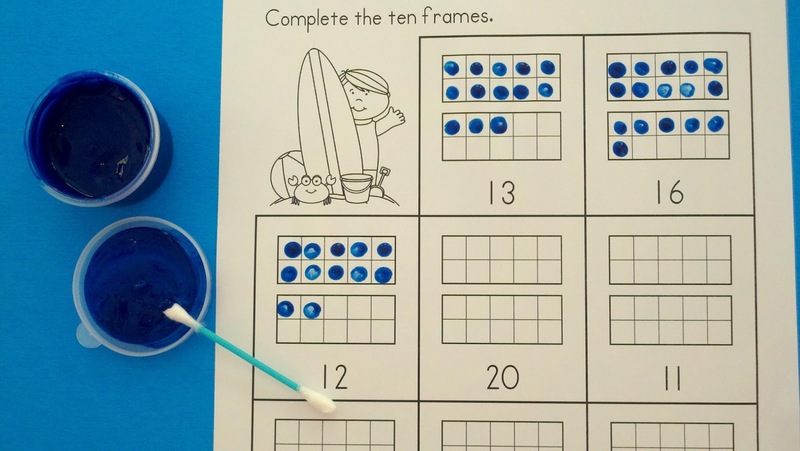 Beach Kids Ten Frames No-Prep Printables contain 34 ten frames no-prep printable pages for your learners to practice counting and labeling quantities of 11 to 20. This packet offers 2 different ink friendly formats to provide differentiation opportunities to best meet your learners’ needs. With the first format option, learners write the numeral for the quantity represented by the ten frames graphic. The second format option allows learners to complete ten frames for a given numeral. There is a beach kids themed line art graphic printed on each page. The beach kids themed graphics include kids surfing, kids with seashells, kids with sand pails, kids playing in the water, a girl by a palm tree, a kid lifeguard, a boy under a beach umbrella, and a girl building a sandcastle. Have fun with your friends at the beach!